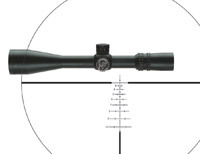 Traditions Ultralight Vortek high-performance break-action inline .50 muzzleloader is built to launch conicals or saboted bullets 200 yards or more, at velocities approaching big-bore centerfire rifles. In fact, the straight-line synthetic stock would look right at home on a centerfire rifle, as would the tapered, fluted and ported chrome moly steel barrel. 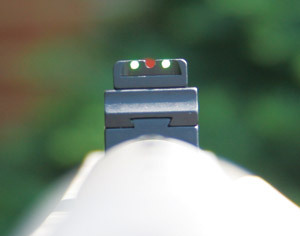 Comes equipped with Williams fully adjustable metallic fiber optic sites; also drilled and tapped for mounting a scope. 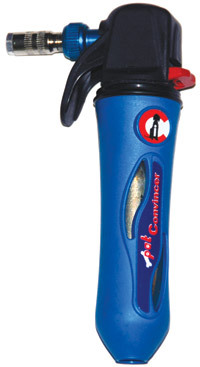 Comes with fully adjustable metallic fiber optic sights. 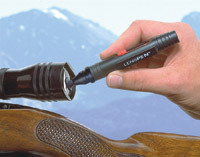 The Accelerator Breech Plug directs the full fire of a 209 shotgun primer into the powder charge, efficiently igniting up to 150 grains of loose powder or three 50-grain-equivalent pellets. We loaded our test rifle with Hodgdon Triple Seven Pellets and saboted 275-grain Traditions LTB hunting bullets, perhaps not as streamlined as the latest spire point bullets, but a proven load for white-tailed deer at close and long range. Three-shot groups, fired from the bench and sighted with a Leupold VX-3 4.5-14x40mm hunting scope, measured 2 inches and less at 100 yards. The trigger broke at a crisp 3 pounds, 6 ounces. 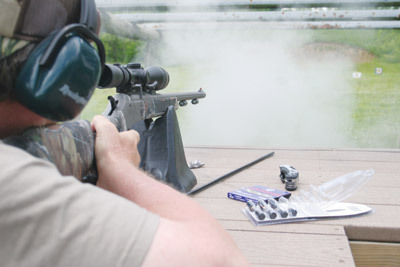 Ported muzzle helped tame muzzle jump from the powerful 150-grain equivalent loads. 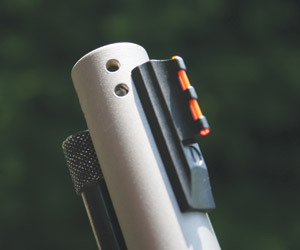 In addition to 360 Degree porting, the muzzle of the 28-inch barrel (1-28 rifling) incorporates an over-bore Projectile Alignment System that makes it easy to start saboted bullets. 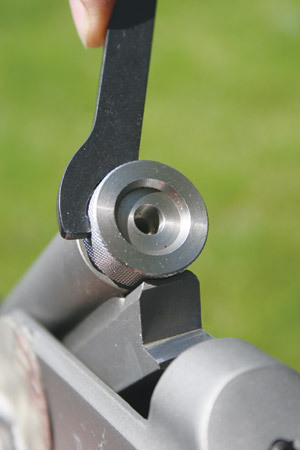 The breech plug screws out with just fingertip pressure, allowing the shooter to unload without firing. 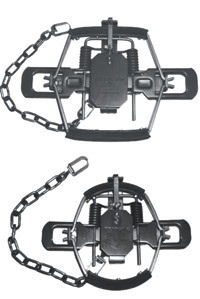 The trigger assembly can be pulled following removal of a single screw, ideal for field maintenance or fast cleanup. Breech plug easily screwed out for unloading or a quick cleanup later.